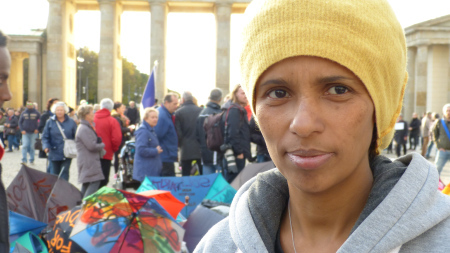 A group of Asylum seekers, who call themselves Non-Citizens, are on hunger strike at the Brandenburger Tor in Berlin. The men and women, from various countries in Asia and Africa, are protesting for their right to remain in Germany and against the inhuman conditions they suffered while waiting for their asylum claims to be processed. Most of them have been in asylum camps for several months and even years. 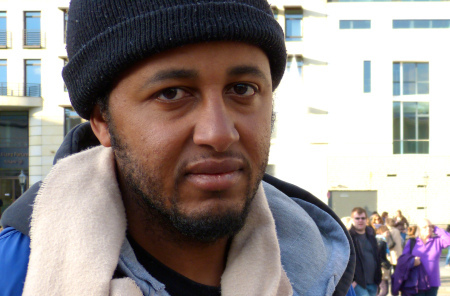 Their hunger strike is part of a nationwide protest of asylum seekers in Germany. Today, on October 18th, the protesters have been going without food for ten days, and without water for five days. 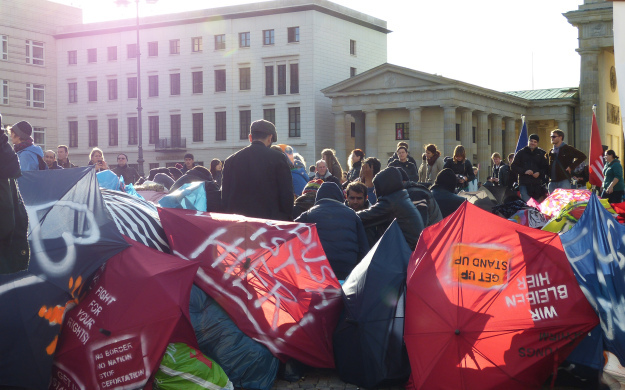 Many of them have been admitted to hospital but returned to the protest camp at Pariser Platz. So far an official repsonse from the German government is missing. How did you come to Germany? and If you are granted asylum in Germany – What would you like to do? I left my country because of the political situation. I came from Greece to Germany. To get to Greece was a lot of trouble. I walked and took a boat, slept in the streets and finally I got to Germany. If you are granted asylum in Germany – What would you like to do? If I had a wish I’d be a hairdresser. But I have had no answer from the government for 2 years and can’t do any work. I personally left my country because I was at the risk of my life. My political views made me a target for the government. I came by plane like many of us here in the camp but some also came on different routes. Since I have arrived one and a half years have passed and I have been living like a prisoner. If I get accepted here I want to live a normal life. Like you or any other perosn here. I was a cook and I’d like to do that again and also study political science so that I can help others who are struggling in my home country. I can’t say why I left my country. Let’s say for personal reasons. I want to learn the language first. It’s importnat to speak the language so that I can be like a normal Mensch (smiles). At home I was a painter, an artist and I still do that now. In 1997 many members of the opposition party were hunted down. My family was also under threat and I left after my family had to hide. I came by plane without a visa, just a passport. When I arrived in Munich they took my passport and put me in a Lager. At home I was an accountant. Here I first have to learn deutsch then I can be an accountant again maybe. But I was not allowed to move away from the Lager for more than 40 kilometres, but I also can not go back home because I would lose my life. I was part of an anti-Taliban group but I had no support from the political parties which means I got into trouble with some religious groups. So I had to leave my country. I came here by ship. When I arrived I admitted my asylum application immediately, but I’m still waiting to hear from the authorities. I want to do something good for society. I don’t care what job I have to do but I want to be free to do something positive for society.